PARIS – Until the late 1980s, France produced millions of berets a year. Laulhere, a 174-year-old beret- maker, is fighting to keep the quintessential French headgear French. Laulhere became the country’s sole maker of traditional berets after it recently bought Blancq-Olibet, its only French competitor, which was almost 200 years old. Cheaper knockoffs from China, India and the Czech Republic made survival hard for local makers of berets, which have been as much a symbol of France as baguettes and Gauloises cigarettes. The fight for survival by Laulhere – rescued in a purchase by French military garment-maker Cargo-Promodis with a €500,000 ($688,150) injection in late 2012 – tells the tale of President Francois Hollande’s competitiveness challenge. French companies struggling to compete and retain market share have contributed to the nation’s slumping economy, which barely grew after 2012 and left unemployment at a 16-year high. While Mr. Hollande promotes broader economic themes, industry minister Arnaud Montebourg focuses on iconic French products and the ‘Made in France’ label to create local jobs. In October 2012, he posed on the cover of Le Parisien magazine standing before the French flag in a sailor’s jersey, wearing a Michel Herbelin watch and holding a Moulinex blender to defend the country’s industry. In April, he participated in a ‘Made in France’ fair in Paris, touring booths wearing a Laulhere beret. Laulhere’s Mr Saunders, married to a French woman whose family has been in the beret business for generations, says the company is banking on demand from the high end of the market to revive its fortunes after its bankruptcy in 2012. The company plans to produce 200,000 hats this year, up from 160,000 in 2013. Half of its beret production goes to armies around the world. The rest goes to the fashion industry and to traditional wearers of the headgear. Men’s berets from Laulhere can cost anywhere from €40 to €75 ($55 – $103), while the women’s version is priced between €20 to €95 ($28 – 131). Imports can cost as little as €2 ($2.75). Global competition has come from berets manufacturers in China, Pakistan, India and the Czech Republic, where the company Tonak produces fashion berets for women. 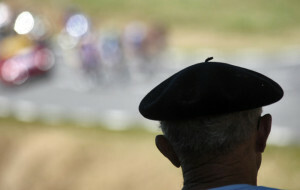 Until the late 1980s, France produced several million berets each year. Sales slid for decades, with cheaper products made in Asia. The nail in the coffin came in 2001 when the French military ended conscriptions, eliminating hundreds of thousands of army orders. The traditional French beret is made with a half mile of merino wool and has a ring of leather inside to help it fit snuggly on the head, Saunders said. It’s waterproof and resistant to ultraviolet light. It keeps its shape even after it’s been rolled. While factories started making them industrially in the early 19th century, the “beret Basque” was at first a cottage industry, with the headwear made in the homes of shepherds. High winds are to blame for a shockingly large amount of tumbleweeds that have blown into a neighborhood south of Colorado Springs. The tumbleweeds piled up in front of homes in a new development in the town of Fountain, and the piles that covered the road and cars were are as high as 10 feet in some places. Residents say the tumbleweeds blew in in an instant, and that the winds that brought them in were so strong it felt like a tornado. The tumbleweeds climbed up the sides of some homes and the bundles of branches blocked driveways, sidewalks and windows. “My wife got home from work and said she couldn’t get in the garage and I got home shortly after her to find all the tumbleweeds,” said Ben, a homeowner in the neighborhood. 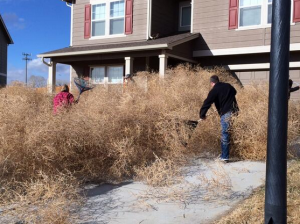 He said their house has been invaded by tumbleweeds other times but their’s is usually the only one. This week’s situation is much different, he said. Neighbors are now working to clean up the mess. They say representatives from El Paso County and their HOA have told them they won’t help with the cleanup. On Tuesday one resident was blindly bulldozing a path through the branches in his pickup truck. Others were out with snow shovels and brooms. Most of the tumbleweeds now sit across the street from many of the homes in a rectangular area that’s almost as big as a football field. If a new wind event were to move in, the tumbleweeds would likely just create a big mess in the neighborhood all over again. 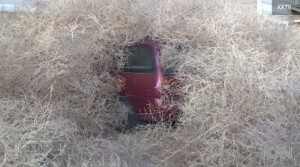 Tumbleweeds pose a fire hazard in dry conditions. The Japanese government is funding matchmaking events in a desperate attempt to boost a birth rate that has halved over the past six decades. Prime Minister Shinzo Abe has allocated an additional 3 billion yen ($29 million) in this fiscal year’s budget for birthrate-boosting programmes as part of a strategy to reverse the nation’s shrinking population. Japan is home to one of the fastest ageing societies in the world, with the population shrinking at a record 244,000 in 2013 alone, according to government figures. The support of marriage – and the active encouragement of young people to settle down – is regarded by government policy-makers as a key strategy for boosting the nation’s birth rate. As a result, local authorities are now able to apply for central government grants of up to 40 million yen ($388,840) for projects relating to supporting marriage and boosting birth rates, according to Bloomberg. 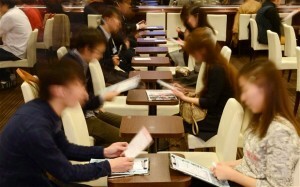 Matchmaking events organised by local authorities, where young singles are introduced to one another in romantic settings, are becoming increasingly common in areas such as rural Kochi, a prefecture around 500 miles west of Tokyo. Officials in Kochi organise coffee and cake events in rural cafes, complete with a romantic soundtrack of live piano music, to try and boost marriage and birth rates. Japan’s population is forecast to lose a third of its population in the next 50 years if current trends continue, with social security costs projected to rise to 24.4 per cent of gross domestic product as early as March 2026. Last year’s official figures show that the number of births fell to 1.03 million, the lowest since data began in 1899. A key pioneer of practical ways to boost the birth rate is Yuriko Koike, a policy maker and former cabinet minister with the ruling Liberal Democratic Party (LDP), who also heads a LDP panel that promotes spouse-hunting events and singles parties known as “machikon”, attended by hundreds of people at a time. Sayaka Inoue, 28, an office worker from Tokyo, has been to three “machikon” parties in the past two years, in order to fulfill her goal of getting married by the time she reaches 30. From London’s Daily Telegraph and CBS Local, Dallas.